Welcome to a visual revolution in movies! Though it was the first of its kind, to this day there is nothing that looks like TRON. It’s a piece of unique art frozen in time; released in that transitional period of 1982 when pinball games were gradually being replaced by the black-screen frenetics of Space Invaders and Pac-Man, movie-making computer technology moved so fast after TRON’s creation that no one had the time to make another movie that looked like it! Jeff Bridges is Kevin Flynn, a computer programmer whose most commercial computer game, Space Paranoids, was stolen by a corporate suit, Dillinger (David Warner). Buried deep in the mainframe of the Master Control Program is the information that can prove Flynn’s ownership – but Dillinger has installed firewall programs to thwart all Flynn’s attempts at infiltration. A simple premise that could have degenerated to a man typing commands on a computer screen for 2 hours. But the wonder of TRON is how director-writer Steve Lisberger and co-writer Bonnie MacBird make the computer blips – literal. When Flynn types commands in the real world, searching for a pathway to the restricted information, we see what is “really” happening in the computer world: an analog of Flynn, called Clu (Jeff Bridges in neon spandex and speaking like an automaton, with a geometrical shape as a sidekick, called Bit) roams neon corridors in a tank, while “bad” programs (troops in different-colored neon spandex) hunt him in pillared interceptor ships called Recognizers. Flynn’s friends Alan (Bruce Boxleitner) and Lora (Cindy Morgan, token T&A, the Michelle Pfeiffer of her day) help him infiltrate a secure computer facility where Lora is working on laser teleportation experiments with old scientist Barnard Hughes. It’s a lucky coincidence that the laser teleportation beam is aimed directly at Flynn’s back when the Master Control Program (MCP) decides to disassemble Flynn’s molecules and drag him into the computer world, eh? Say hello to Filmic Device No.15 – the Convenient Laser Teleportation Device. Flynn finds himself in a glowing geometrical landscape, forced to do battle like a gladiator in The Games – basic videogames like Pong visualized in three dimensions (a light-ball hurled at opponents, trying to destroy their floor grid); light-cycles, from that flat screen game where the object is to block off your opponent’s line, now deadly designer motorbikes with fatal slipstreams; the identity disk (which looks suspiciously like a cheap Frisbee) wielded like a lethal discus – which wouldn’t be so bad if Flynn wasn’t expected to strike fear into the hearts of his opponents while wearing spandex, a bicycling helmet and a skort.Lose any game and he would be “de-rezzed” (that is, suffer de-resolution/death). Which makes us question the methods of the MCP, who could have simply had Flynn killed by Sark (Dillinger’s computer analog, replete with cricket pads and funny helmet) instead of going to all the Bond Villain trouble of putting him on the Games grid and giving him the means to destroy the MCP itself. Flynn meets Alan’s analog, called Tron – a master gladiator – also trying to destroy the MCP’s evil grip on computer-land. And Yori, Lora’s analog, Tron’s girl and eternal pear-bottom. What made the computer grid leap at us was the camera moving around the “digital” space in 360 degrees; we are not simply looking at a flat plane that is supposedly “three dimensional,” we swoop through the environment and around the objects. Yet the shots containing actors in the computer environment were rock steady – but you will never notice due to the elegant direction. The actors were shot in black and white (which accounts for the “noisy” grain on their faces) and their costume colors were added later. In a “dumb kiddie movie” – allegory about the futility of believing in gods that prove they cannot run the world efficiently. Barnard Hughes says at one point, “The Computers and the Programs will start thinking and the people will stop!” Hey, is he talking about us? There is an iconic shot of a computer grid/masterboard, with little lights traveling along it in orderly directions; panning back, it dissolves to a shot of a night city with cars traveling along designated streets. The computer is a little city unto itself. Like CITIZEN KANE, TRON needs to be viewed in context of its times: in the early 80s there was no such thing as internet, cyberspace, bits; the computer game that Flynn is playing in the real world features a 3D landscape, a style of gaming which would not be invented for over a decade; CEO Dillinger sits behind a giant glossy desk that has computer screens built into its surface – almost like an Arthur C. Clarke technology vision. Even the word “hacker” was new, “programs” were something you watched on TV, and “Random Access Memory” was something you did while trying to pass a drunk driving test. TRON is not a “great” film; there are annoying little syntax errors throughout – Flynn attacking Tron and being pushed off the ship, Lora kissing Flynn ever so passionately and then two minutes later giving the exact same sugar to Tron without flinching or mentioning it, some of the hokey set design and acting – but it is a landmark film, brazenly going where no User has gone before and creating its own identity. Shaped like a lethal Frisbee. 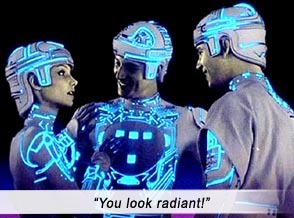 aka: TRON: THE ORIGINAL CLASSIC. Writers: Steve Lisberger, Bonnie MacBird. Starring: Jeff Bridges, Bruce Boxleitner, Cindy Morgan, David Warner, Barnard Hughes, Dan Shor, Peter Jurasik, Tony Stephano, Sam Schatz.